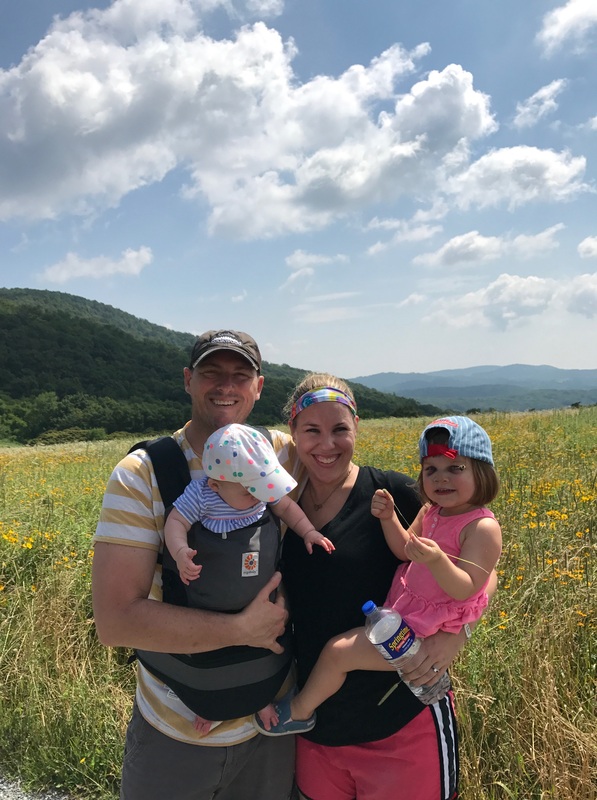 Our family is in the middle of a wild, wild few weeks… our typical schedule is a little chaotic, at best, but these next couple are real doozies. Last week teed us off with my typical work schedule, plus 2 most-of-the-day events on my normal off days, a quick trip out of town on Saturday, and a work event on Sunday. Thursday morning I was preparing to walk out the door to hop on a conference call en route to a work lunch, then pick up some supplies I’d need for this weekend’s 24 hour event and finally wrap the day at a work dinner. Thursday happened to be my most flexible day of the grueling 21, and the girls and I spent the morning playing around the house, when I decided to really stretch the realms of my normal self and (gasp!) mop the kitchen floor. Nora Beth is really, really into helping spray and wipe, and she loved using her little play mop to follow the streaks we were making. Inevitably she lost interest in our cleaning activity, found a bouncy ball… I mean, a “ver-wee special tweasure,” threw it over the counter, and would chase it (she now uses the word “fetch” instead of “catch,” and it really sounds about right). I warned her multiple times to be careful running since the floor was still drying, but, as I should have anticipated, my advice went unheeded, and while I was tending to Annablair, preparing for our sitter to arrive, her fetching turned to wails as she hit a still-damp spot, and skidded right into the cross beam of our sofa. I knew immediately that it wasn’t a hit that would just be shaken off. I ran over, scooped her up, and saw the blood, swelling and bruising was instantaneous. 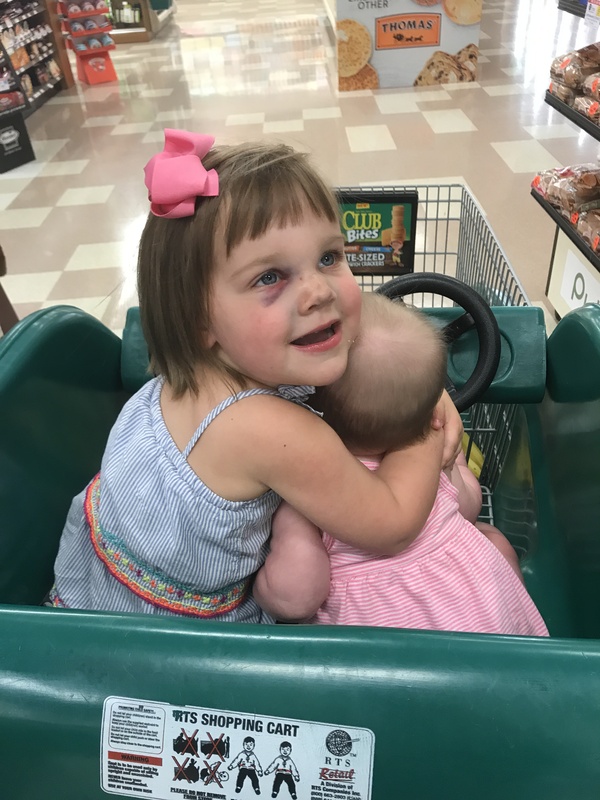 I was holding both girls and deciding my next steps… made quick calls to David and my mom and let them know that I thought her nose was broken. Right at that minute, our sitter and her mom walked in to see the girls and found NorBeff sobbing and looking worse and worse by the minute. It was truly divine timing, as I quickly and flusteredly (that is not a word… but now it is. There.) grabbed what we may need for the hospital or doctor, hastily explained Annablair’s schedule to our sweet sitter and dashed out the door. I called the pediatrician and asked where I should take her and ended up at the pediatric ER. By then, she had cried herself to sleep but woke up in great spirits and charmed and entertained the ER crew during our time there. David met us for a while, and she was so excited to see him and show him all the fish and toys in the waiting room. By the time we were discharged, she resisted going home… but who would want to leave when you get to lay in a bed, watch TV and be served popsicles, vending machine snacks and juice? Once we left, we jetted through Chick-fil-A, since nothing cures a no-lunch, no-nap, injured nose quite like nuggets, and headed straight to my mom’s to scoop up Annablair and get some great Nina snuggles. After getting home and putting the girls to bed, I knew I needed two things: exercise and wine. So I poured 2 glasses… one to catch some pesky flies that have been tormenting our kitchen and one to, uh, hydrate myself during a Kayla Itsines circuit. The sweat and endorphins certainly did me well, and before curling up for the evening with my homegirls Rizzoli & Isles, I threw some food prep together and blindly grabbed my wine glass and took a swig… except… I hadn’t looked at which I was sipping untillllll something ended up in my mouth. Something winged. – Wine really is a great fly trap. – A black fly in your sauvignon blanc is a real tragedy, not just an ironic lyric, Alanis Morissette. – Look before you drink. Thankfully, NB’s swelling has gone down considerably since Thursday, but her black eyes have set in quite nicely. 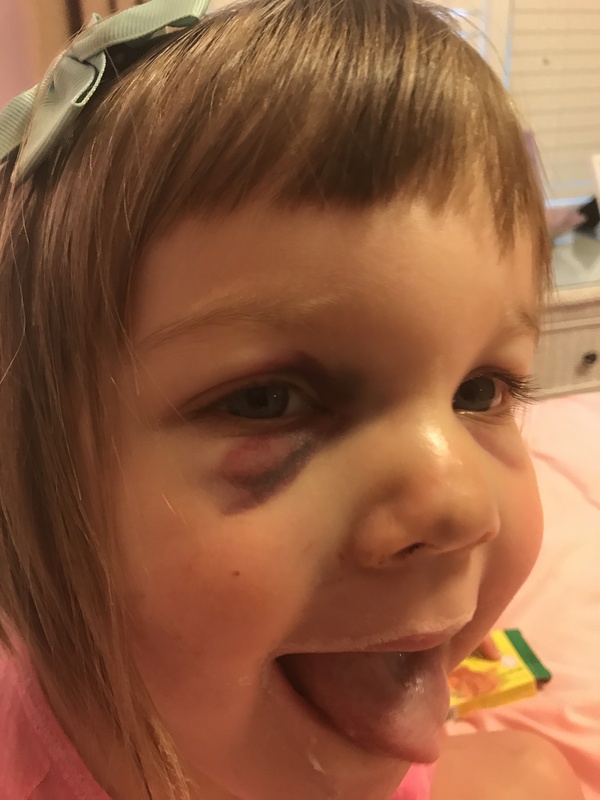 I’m hopeful that the final puffery will resolve this week, and that the bruising will lighten up before her trip down the aisle as the flower girl in my sister’s wedding!